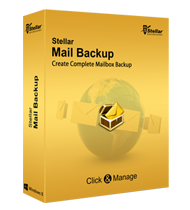 Stellar Mail Backup is a comprehensive and user-friendly solution to backup mail profiles of Outlook Express, MS Outlook, and Windows Mail clients. With the help of this tool, you can take differential backups of emails and all other objects, including contacts, tasks, notes, calendar entries, journals, etc. In addition, the software allows you to schedule the backup tasks to run at a specified time with the desired frequency.